Gettysburg Foundation - Gettysburg Foundation Stays Committed to LEED Gold Designation: Declares Earth Week! 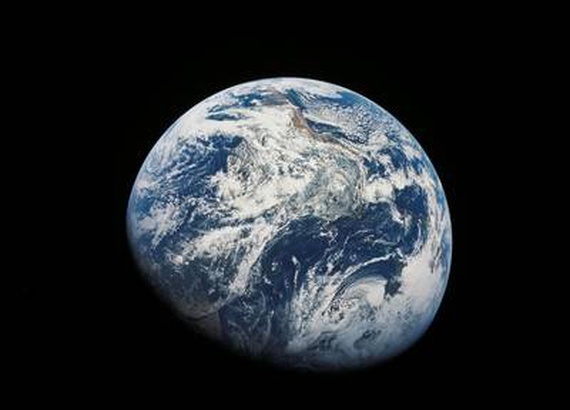 Earth from space, courtesy of NASA image library. The Gettysburg Foundation honors our environment in numerous ways every day. We celebrate Earth Day 2018 by declaring Earth Week following Earth Day this year. Part of the Foundation's mission is stewardship—of battlefield, monuments, artifacts and archives—and our environment. From the very beginning, the environment and its preservation was an integral part of the planning for the Museum and Visitor Center. When designing the Museum and Visitor Center, the Foundation set out to reach LEED Silver status, but exceeded that goal by achieving LEED Gold status in 2010. This facility was one of only four, LEED-Gold Certified museums in the United States when it opened in 2008. The LEED Green Building Rating System is the nationally accepted benchmark for design, construction and operation of high performance green buildings, and is awarded by the U.S. Green Building Council (USGBC). LEED standards, based on well-founded scientific standards, emphasize state-of-the-art strategies for sustainable site development, water savings, energy efficiency, material selection, indoor environmental quality and innovative design. We could not be true to our LEED goal without paying attention to the impact the organization has on the health and balance of our planet. To this end, we strive to minimize our environmental footprint. At the same time, we must maintain specific conditions necessary for the preservation of countless artifacts from the American Civil War, as well as the historic Gettysburg Cyclorama—the massive, 360 degree oil painting that depicts Pickett’s Charge. The Gettysburg Foundation’s commitment to the LEED Gold certification has required several critical adjustments to optimize energy and cost savings—known as the “daily operations energy savings adjustments.” Our facilities team took measures to cut back air handling units by installing variable-frequency drives in them. They also adjusted temperatures and relative humidity to reduce energy consumption when the facility is closed. The team replaced halogen spotlights with LED fixtures and developed an emergency lighting schedule using the building’s automation system. These adjustments reduced our electricity usage by 32%. The most recent initiatives are the addition of 103 new geothermal wells to increase energy efficiency while further reducing energy costs; and the installation of two, level-two chargers for visitors using electric cars. The level-two charger can power up an electric vehicle in about two to three hours.